DAYTONA, Florida — Race cars are a lot more like production cars than most people think. These days, in the IMSA GTD class, that similarity even means things like mid-cycle refreshes‚ like the Acura NSX GT3 Evo. For the 2019 race season, kicking off this weekend at the Rolex 24 at Daytona International Speedway, that means a host of small updates that add up to a subtly but significantly improved car‚ not unlike the updates to the road-going 2019 NSX we sampled late last year. The most obvious upgrades that differentiate the NSX GT3 Evo from its predecessor are the revised front splitter, diffuser, and rear bumper, which work together to create less drag at high speed while preserving cooling and aerodynamic balance. Speaking with Katherine Legge, driver of the No. 57 Heinricher Racing/Meyers-Shank Racing Caterpillar NSX GT3 Evo, before the race, we learned the new car is easier to drive, and therefore should be more approachable for a wider range of customer racers. Other updates to the new NSX GT3 Evo includes a pair of new single-scroll turbochargers, designed to improve throttle response and boost control, while also improving fuel economy. Improved cooling, ABS, and an upgraded Bosch data logging system further improve the driver-machine symbiosis. Acura says its upgrades are the result of feedback and analysis of customer racing teams and their cars, generated over the past two years of competition and testing. For teams with the previous-spec NSX GT3, the update will be straightforward: there’s a handy package to retrofit older cars with most of the new updates. Not updated is the engine block, which continues as the same production-based 3.5-liter V-6 engine. The same design specification as the production engine is used for the race car’s block, heads, valve train, crankshaft, pistons, and dry-sump lubrication system. One production system that doesn’t make the transition to the race car is they hybrid portion of the drivetrain. The resulting loss of 700 lbs and a great deal of complexity makes it not only easier on tires and easier for teams to work on safely, but also because all-wheel drive isn’t allowed in the GTD class at Daytona. The transmission, manufactured by XTRAC, is a semi-automatic six-speed sequential with an electrically assisted carbon clutch. Monster Brembo discs squeezed by six-piston front and four-piston rear calipers, five-way Sachs adjustable dampers, and adjustable front and rear anti-roll bars. 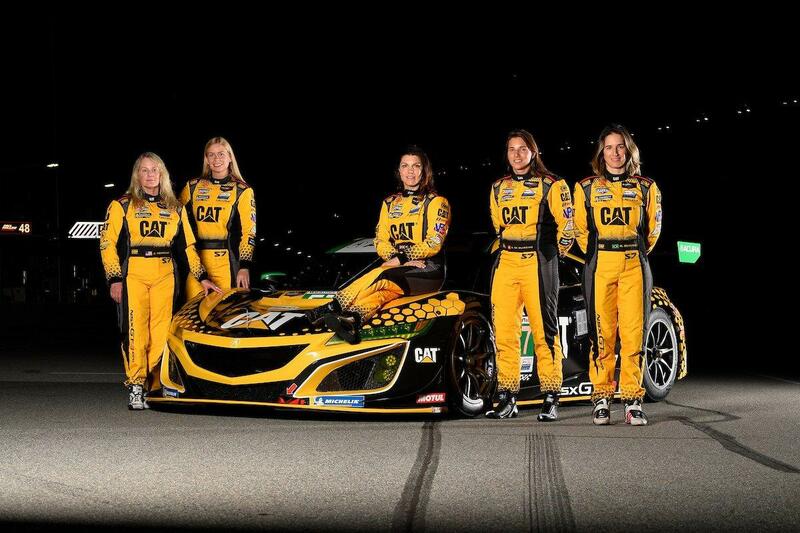 Acura’s latest and greatest GT racer is already kicking off its season this weekend at the Rolex 24, with the Meyer Shank Racing w/Curb-Agajanian NSX GT3 Evo qualifying third in class and the Caterpillar car of Legge, Simona De Silvestro, and Ana Beatriz qualifying 11th. Regardless of where the cars start, however, a 24-hour race is one of attrition as much as one of pace and Acura hopes its improvements, which have combined to yield a 25-percent increase in engine life, will help its customer teams to be where they need to be at the end of the race, when it counts.